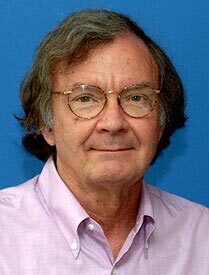 As a former president put it, "The problem of handing down RAS knowledge from generation to generation is similar to the difficulties the Nuclear Regulartory Commission is having in trying to determine the best way to scare people away from a permanent nuclear depository for 100,000 years. The average lifetime of a RAS member is about two years, so there have been approximately 80 generations of members since the "Golden Days" of Sagan & Co. in the early 1950's." Because of this, nearly all information retained about the RAS is in the form of logbooks. Nestled among the thousands of entries made by hundreds of members there exists the occasional morsel that brings an enlightenment for the reader. Tidbits of university history, of love won and lost, and of the great astronomical moments of the past fifty years appear in the records. buildings, which were secured from the United States government in 1894.
instruction are kept in Room 35 of the Ryerson Physical Laboratory. best type of portrait lens for the Bruce Photographic Telescope. equipment of the Students' Observatory. 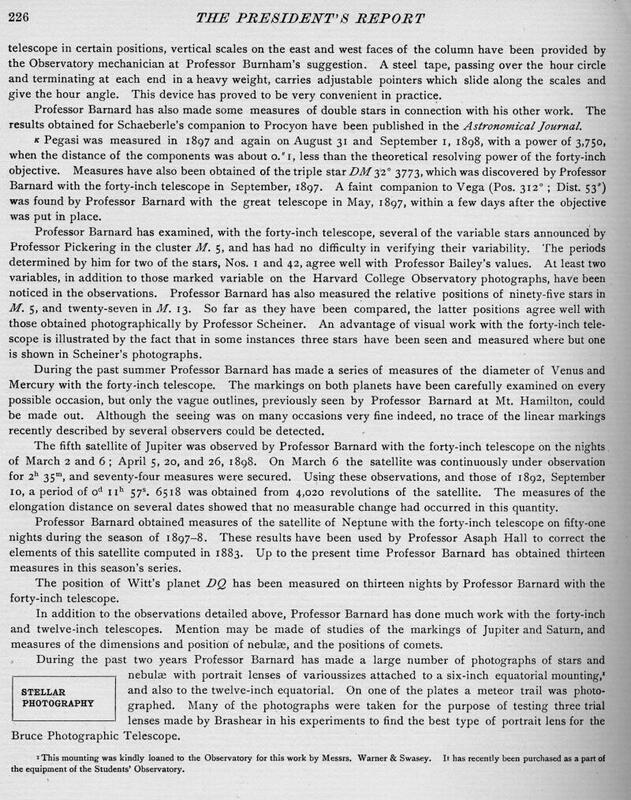 The mount was purchased early for Barnard, probably while he was idling at Yerkes waiting for the 40-inch refractor to be ready. It took Hale a few years before the six-inch Petitdidier lens was bought and installed. 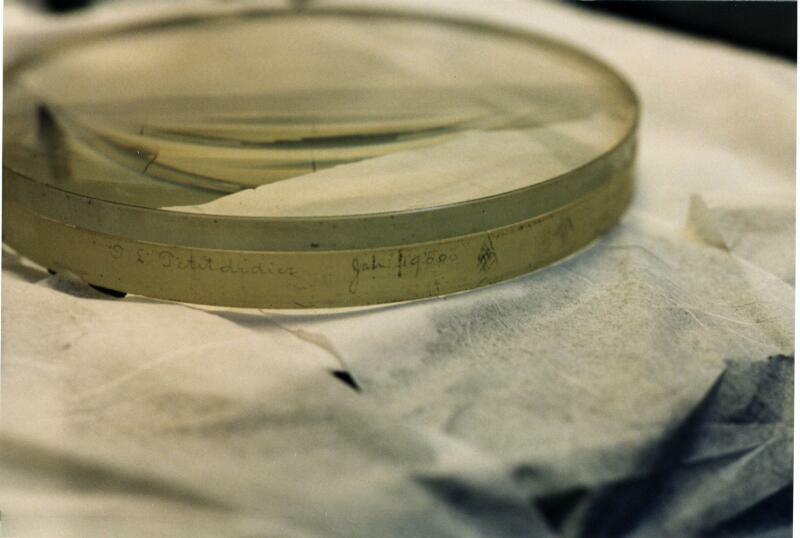 In January of 1900, the French-born optician Octave Leon Petitdidier signed his name on the side of a six-inch refractor lens. While not widely known, he was good enough for Albert A. Michelson to have him make optics for the second ether experiment involving his newly invented intereferometer1. The lens was a six and 1/4 inch achromat of 80 inch focal length (approximately f/15). Its design is opposite of most refractors: the crown element, normally skyward, is placed in the back, with the flint lens facing forwards! This design is normally attributed to the great telescope maker John Brashear of Pittsburgh. For a short time period, the Ryerson lens was believed to be by Brashear because of the reversed design, but later evidence proved it to be by Petididier. At some point the telescope ended up in a dome on what is now the lobby to the Brain Surgery Research Institute, located between 58th and 58th streets on Ellis Avenue. 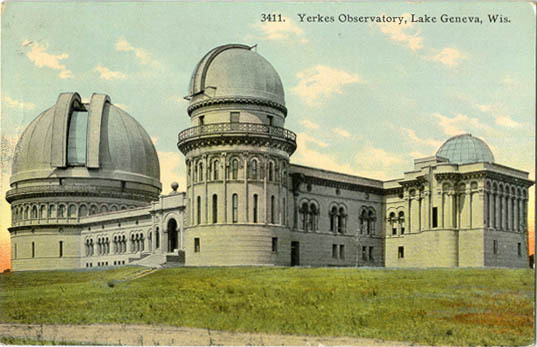 A photograph hanging up in the main hall of Yerkes Observatory from 1906-7 shows a fledgling university, mired in mud, with a tiny dome and building sitting to the south the bookstore. The only documents in the Society office surviving from this time period deal with the errors of a screw used in an 8" by 10" camera. One is a handwritten mathematical measurement of the actual screw; the other is a National Bureau of Standards table for a screw. The handwritten document spans the years 1904 to 1905; the NBS document is from 1904. A look at University plans for the construction of future buildings on campus shows a 'student observatory' planned. This building would be connected to the new astronomy department building just east of Ryerson. This never occurred and instead the math department received Eckhart Hall. 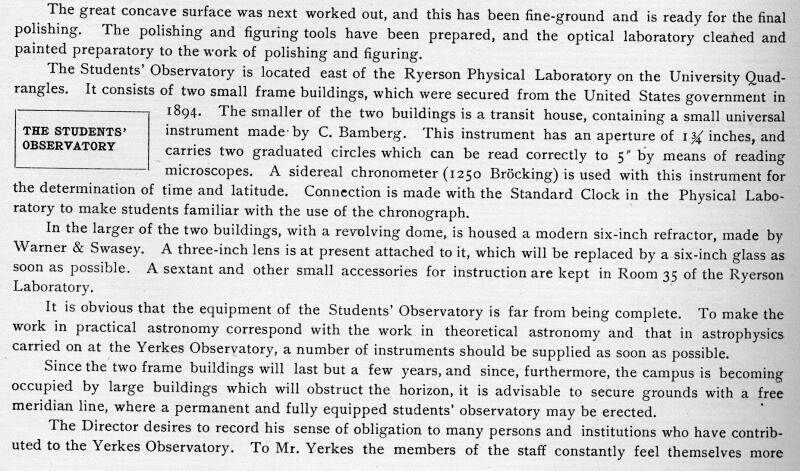 For whatever reason, this led to the dome and telescope being put on Ryerson Hall. It is clear in a 30's era aerial photograph of the University that the dome on Ryerson wasn't there until 1937. In 1996 members who were removing old insulation from the cylinder of the dome found a board with an inscription of 'Work Here Friday 18th 1937.' Also included were three signatures of Scandinavian workmen, Lars, Nils, and ? (Their last names were unreadable). In February of 1939, a gift by Mr. Oppenheimer allowed the design of a telescope by Astronomy professor Thorton Page and P.C Keenan. Page died in 1996. Construction continued from May until October of a Schmidt camera with a ten-inch primary mirror and a six-inch correcting plate. The camera was mounted onto the refractor using three rings, a skin of sheet metal and a lot of welding. Small chips ( of about 2.25 inches square) of flexible film were placed in a holder that was then inserted into the camera at the focus. First light for the Schmidt occurred on October 11, 1939. Page chose Albireio, or Beta Cygni as the first plate, and the exposure was taken at 8:30 PM. For the next twenty years, a logbook of plates taken in the Schmidt camera was kept. There are some rather humorous notes in the exposures, like " The plates has measles, also stars." Hundreds of these negatives are stored in our office. The mirror was realuminized in January of 1954, and again in 1965 with a Beral coating from P.A. Clausing, a company in Skokie, Illinois that still is patronized by the RAS today. Further coatings are likely to have been done but never recorded in the Schmidt camera book. A mystery-who is Mr. Oppenheimer? The Schmidt book calls the scope " The Oppenheimer Telescope, after Mr. Oppenheimer, of course." Some possibilities: The Oppenheimers of diamond fame, or the J. Robert Oppenheimer of nuclear fame. From the year of 1948, a document called Sphaerometrica Astrographica exists, Dedicated humbly by Alberto V. Sthatzel. who according to a Nov. 6, 1958 entry taught astronomy here. The document cover is very ornnamental with illustrations of dragons, latin expressions and calligraphy, all in the style of classical astronomy texts. Starting in October of 1952, the Society has kept a complete record of its doings in logbooks. What if any records were kept before this time period are lost; only the scattered documents above give any idea to what happened. We consider the logbook covering the period from 1952 to 1964 to contain the glories of the organization. Carl Sagan, Tobias Owen, Elliot Moore, and other astronomers of today entered their early observations into the book. The telescope then was used by Clayton Smith and Toby Owen for solar observations. They were quite extensive; it was virtually all their entries contained. They also used the scope for teaching physical science classes on how to use a scope. 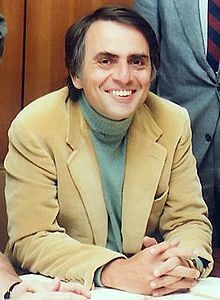 Carl Sagan first appears in the entry of November 11-12, 1952. As was the case usually for autumn in Chicago, seeing was nil. In addition, Sagan noted the common state of the office. From later entries, we guess Sagan knew a little French when he described what's visible as "rien", and that he studied quite a bit in the office. Sample entries can be seen here. On April 21,1953, The Milky Way was visible in Cygnus and a 13.1 magnitude star was seen near R Cor Borealis with the six-inch. These observations were by Elliot Moore. "Taken with a grain of salt." Vandervoort also early on tagged the RAS as being weather-conscious: "submit need for meteorlogical section." 1955: "Elliot Moore (now at Yerkes) confirmed new outside ring of Saturn." In 1956 the Society noticed that the flint element of the objective lens on the six-inch was facing forward. They then reversed the objective lens so the crown was in front. This began the tragic mistake of the RAS for many years. 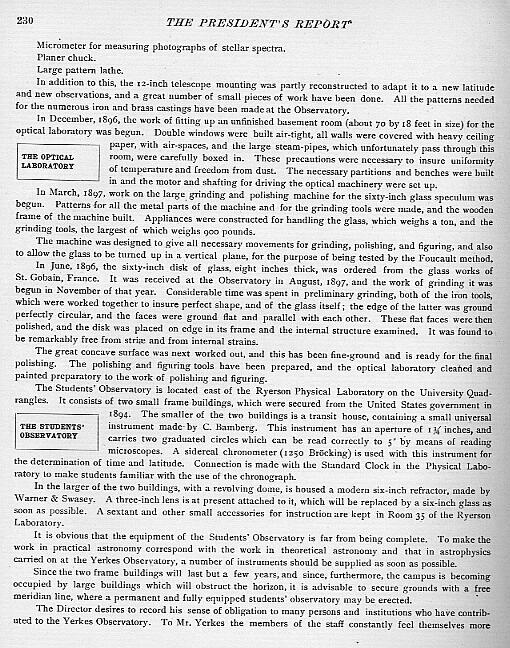 The objective in fact was meant to be flint-forward; John Brashear had designed many a telescope that way. So instead the somewhat oblivious members would leave the objective reversed, and could never correlate their fuzzy views with this. Every five years or so someone new would come in and realize the error, and fix it. This cycle continued until 1989, when the current batch determined the error. October 13th, 1957: "Looked for satellite (artificial) No luck. Too much haze." This was the historic Sputnik I.
of Albert A. Michelson. Scribner, New York. 1973.